Lima Film Festival: La Yuma | personal.amy-wong.com - A Blog by Amy Wong. 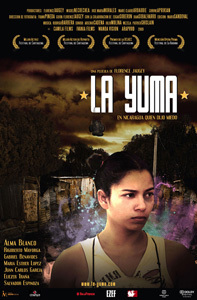 La Yuma — don’t ask me what Yuma means, but La Yuma is the boxing nickname of the character — tells the story of a girl from the poor neighborhoods of Managua, Nicaragua, who wants to become a professional boxer. One day she sees her brother mugging a young journalist who loses a disc with his work, so she decides to return it to him, and decides that she likes him. As she deals with her possible love life, as well as her family life with her younger siblings, good-for-nothing mother with her good-for-nothing boyfriend, she finally gets the chance to train under renown boxing trainer Polvorita. La Yuma pretty much reminded everyone of Girlfight — which launched the career of now the familiar Michelle Rodriguez — for their “tough girl who wants to box” theme, but ultimately La Yuma distances itself from boxing, and focuses on what Alma Blanco’s character has to do for her and her siblings to survive. Since the story starts out as a boxing film, and then distances itself from it… La Yuma seems a bit disjointed, as if you were watching 2 or 3 different films. However, the film’s protagonist is interesting — she’s tough and sassy with a sense of humor — she keeps bringing you back into the story. The acting is a bit uneven, especially from Ernesto (Gabriel Benavides) the “love interest” and you wonder why La Yuma feels attraction towards him, but characters like Doña Scarlett (María Esther López), or La Cubana (Juan Carlos García) are enjoyable and memorable enough. I heard this was a really good movie. Might check this one out. Thanks. Interesting, it drags at times… but it's interesting. It was actually my first Nicaraguan film. Hope you enjoy it.